There was a time when "going to Pueblo" didn't mean visiting the state fair; it meant being committed to the state mental hospital. Take a head trip into the past at the Colorado Mental Health Institute at Pueblo Museum (CMHIP), located at 13th and Francisco Streets in Pueblo. Founded by Nell and Bob Mitchell, the museum preserves and displays much of the institution’s history, including photographs, records, and more. “Our mission is to collect, preserve, interpret, and exhibit artifacts and archives from the Mental Health Institute (formerly Colorado State Hospital). The museum was developed to ensure that the history of CMHIP is not forgotten and that future generations will gain a better understanding of the treatment of the mentally ill in Colorado,” says the museum website. Founded in 1879, there were a lot of ways to land yourself in the Colorado Insane Asylum, now known as the Colorado Mental Health Institute at Pueblo, legitimate mental health reasons being only one. Alcoholism, chronic illness, unbecoming behavior (think unruly teens and “amoral” women), disabilities, and other health conditions were common “ailments” among those committed. And while the institute started relatively small, with around 14 patients, it was soon overflowing with people from all over the state, acting as a catch-all, including for some unfortunates who didn't belong there. "Dr. Thombs says: 'This institution (is) rapidly filling up with chronic insane. These together with chronic epileptics, idiots, and imbeciles who are entirely out of place here and a source of annoyance to the insane, will eventually destroy the object for which the asylum was originally intended, viz., the curability of insanity …'" reported the Central City Weekly Register on Jan. 11, 1889. The population only continued to grow, and by its heyday in the 1960s, the institution and its sprawling facilities (including a dairy farm) housed over 6,000 patients. 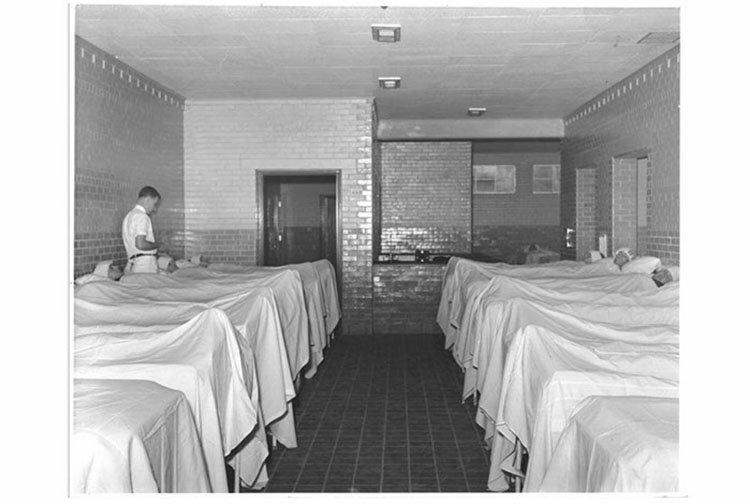 Thanks to a major, nationwide change in patient care in 1961, the hospital evolved from a massive custodial institution to a modern psychiatric center. Today’s Colorado Mental Health Institute of Pueblo still treats patients but has a much smaller residential population thanks to advancements in medication and therapeutic practices. As with many mental institutions of the time period, Pueblo was not without its questionable practices and secrets (including many escapes), some of which are on display at the museum today. Electroshock therapy equipment, straitjackets, and human remains of patients from forgotten unmarked graves are just some of what you will see. Sedative treatment in the hydro pack room. | Courtesy of the Colorado Mental Health Institute at Pueblo Museum. If you are "committed" to stopping by, the cost is free and your tour will consist of a two-minute movie, a 15-minute narrated, photograph presentation of the hospital's history and the time to roam the many, many exhibits spanning over 139 years. The CMHIP Museum is open on Tuesdays from 10 a.m. to 4 p.m. for tours and research purposes or by appointment by calling the Museum at 719-543-2012. If you are a supernatural believer, it is a no-brainer that such an institution, where so many people lived and died, just might be haunted by more than its past. According to Bob and Nell Mitchell, co-founders of the museum, there is an extensive set of tunnels under the institute, some of which that have been closed off and some that are still active. “Some of the older tunnels on the south campus have side doors with passages, and rumors persisted that voices of patients could be heard screaming for help,” the Mitchells wrote in a piece published by the Pueblo Chieftain. You can learn all about these tunnels at the museum, as well. Colorado is full of urban legends and myths. How many of them do you believe are true?